Two years ago, Star Wars fans were introduced to Sphero Inc., with the launch of their now world famous app-controlled BB-8 toy in advance of The Force Awakens. It was like catching lightning in a bottle--a soon to be iconic character from the new film mixed with fun, new technology. 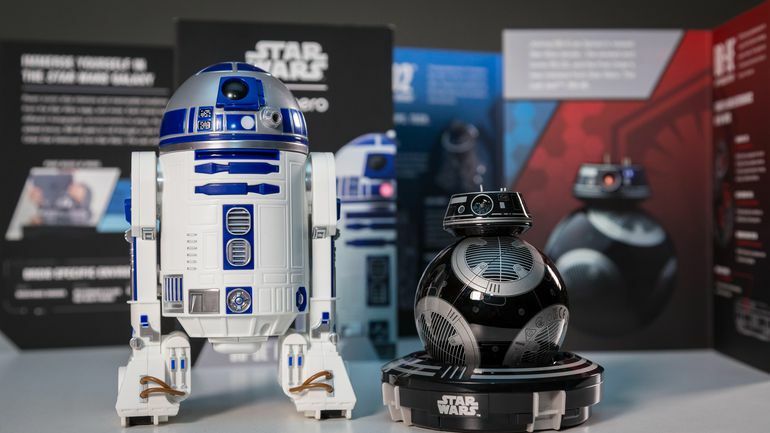 Sphero BB-8 went on to become a worldwide phenomenon and now, two years later, Sphero has launched two follow ups: R2-D2 and BB-9E. BB-9E is the new First Order droid we will be seeing in The Last Jedi (director Rian Johnson revealed on Twitter last month that the droid was nicknamed BB-H8 on the film's set--pronounced “BB-Hate”). Sphero's BB-9E toy is very much an update on their BB-8, introduced in 2015. One of the features of the new toy is its speed: the new droid runs noticeably faster than its Resistance counterpart. It also appeared that BB-9E ran a little smoother when I compared it to the BB-8 I got for Christmas in 2015. The head on the new droid seems to do a better job at staying on the top of the ball as it runs. It's not perfect--the head wobbles all over the place as it speeds along, and it still pops off when you crash your droid into the wall--but it definitely feels like an upgrade. Another obvious technological update by Sphero, compared to my BB-8, are the lights on BB-9E's dome. BB-9E features red and blue LED lights on his dome that stay on as long as the head is connected to the body (the lights will go out if you crash your droid and his head pops off). It's a nice innovation from the Sphero team for their new droid. It would be cool if future versions of BB-8 included a little red light in his main eye (as he does in the films). 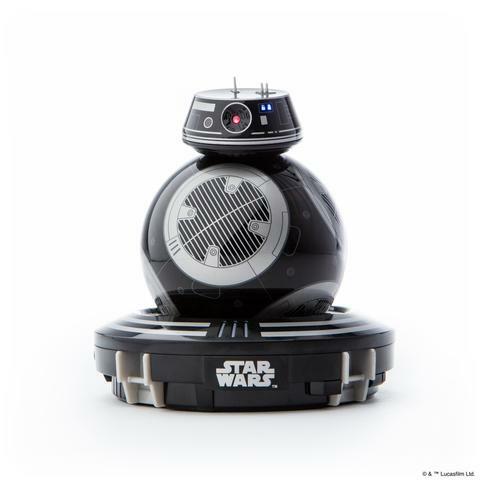 BB-9E seems more of a niche toy than Sphero usually makes. Compared to what we'd seen of BB-8 by this time in 2015 (appearances in two teaser trailers, on stage at Celebration, etc.) we really know nothing about this new character. That said, the Sphero BB-9E will likely be the choice of fans who like BB-8 but wish he was more "dark side". Sphero's other new release is the opposite of niche. Every fan since 1977 has dreamed at one point or another of having their own R2-D2, with some even going as far as to build one for themselves. The Sphero R2-D2 may be the next best thing. I have to be honest, I was not expecting to love this toy as much as I did. I found myself grinning from ear to ear as soon as I fired up the app. R2, more than any other Star Wars toy I've seen (including BB-8), comes to life when you activate him. 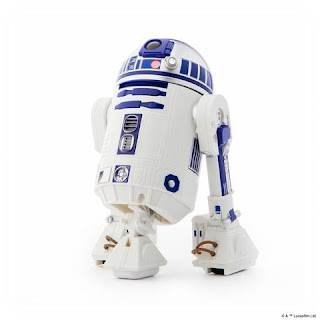 As he does in the films, R2 moves much slower than BB-8 or BB-9E. This makes him easier to control (not that the other two are particularly difficult), which in turn makes his movements truer to the films. There are several features that make R2 even more fun to control. In the app, there are additional movements R2 can do, including getting electrocuted by Jawas (complete with the crashing sound effect), celebratory shaking, and speeding forward. In addition, when R2 speaks, the noises come from the droid rather than the app. and R2 also lights up just the way he does in the film. All of this leads to pure fan joy when you're driving R2 around. I didn't think Sphero could top the experience of piloting BB-8, but they did just that with R2. Maybe it's the fact that R2 is a legacy character who's appeared in every Star Wars film since the debut in 1977, or maybe it's the fact that it's easier to make R2 move exactly the way he does in the film. Regardless, Sphero's R2-D2 is probably my favourite Star Wars toy of the past few years. Another new feature all for all of Sphero’s droids is an augmented reality (AR) experience, known as the holographic display, that comes with the app. The AR experience is available in the Sphero droids app and requires the droid trainer which comes included with the BB-9E droid. When you place your droid on the droid trainer and launch the AR experience you will be able to use your droid to explore various ships from the Star Wars galaxy. Each droid allows you to experience a different ship:BB-8 lets you explore the Resistance cruiser Raddus from The Last Jedi, BB-9E lets you explore the First Order Mega-Star Destroyer Supremacy from The Last Jedi, and R2-D2 lets you explore The Millennium Falcon). I found the AR "Holographic Display" feature fun as a one-time experience. As you drive your droid around, there are informational pop-ups that share different tidbits about the ship you're exploring (including some teases about The Last Jedi). But the downside is that after you have checked out each AR experience once there is nothing to really make you want to revisit them. Perhaps it would be cool if, in future updates to the app or the droids, Sphero could add some games to entice users to return to the AR experience beyond the initial exploration. More generally, it would be interesting if Sphero looked into adding some sort of additional play-ability or games into future app updates or droids. On their own, the droids are a thrill to play with, and Sphero has added a feature that enables the droids to interact with one another, but additional games or play features might be a way to add something extra to some already cool products. Overall, the Sphero droids are great fun and some of the best Star Wars products available today. Sphero has managed to build on the success they had in 2015 and they’ve created two new products that bring new levels of enjoyment with iconic characters. You can find out more about the Sphero droids (and order your own) here. Not to mention R2 has a THIRD LEG!!!!! That retracts!!!! OMG!